Do You Know About the Ecosystem Way of Cooking? When I was growing up, my family’s kitchen was frugal and ingredient-conscious. I have always felt bad about food waste. So I was delighted to discover Eugenia Bone’s The Kitchen Ecosystem (Clarkson Potter, 2014). Her philosophy? Waste nothing. When you pay extra to get fresh, local, organic ingredients—as we do—why not use them completely, right down to the peel? Bone, the author of several other cookbooks, says that it took her twenty-five years to develop the ecosystem way of cooking: “I eat fresh, preserve, and turn the stuff I would normally toss into useful ingredients.” Calmful Living spoke recently with Bone about her book, her philosophy, and how time-strapped home cooks can capitalize on her kitchen wisdom. OC: Tell me more about the kitchen ecosystem. 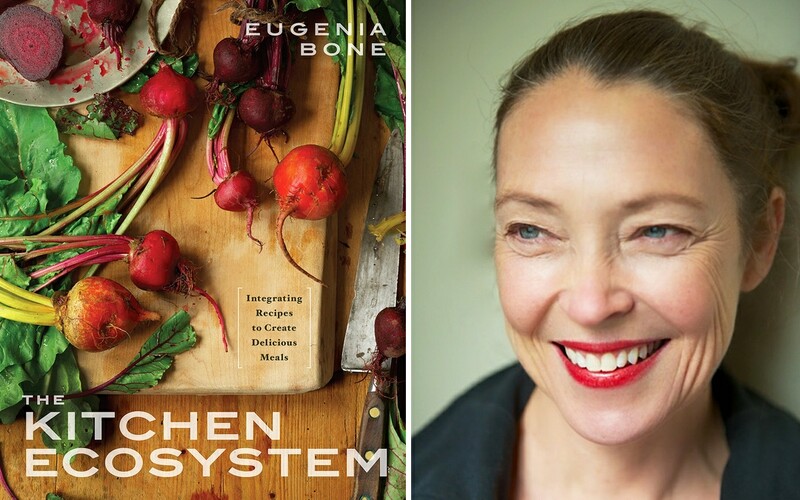 Eugenia Bone: I call it an ecosystem because I noticed parallels between nature’s ecosystems and my kitchen. There’s similarity in what makes it functional. Just as there is a diversity of critters, in my kitchen there is a diversity of flavors, of homemade canned foods and condiments. And there is integration and symbiosis. The more waste I use, the better—the higher the flavor and more effective and efficient the kitchen ecosystem. OC: How did you develop your own kitchen ecosystem? EB: The Kitchen Ecosystem is the sum total of what I’ve learned about cooking over twenty-five to thirty years. I’ve been cooking this way for many years: seasonal, fresh, ingredient-based food, eating some fresh and preserving some with the intention of using the preserves in recipes later in the year. For The Kitchen Ecosystem, I thought deeply about the kitchen components that produce good food, and how that can work in a twenty-first-century lifestyle. Before World War II, everyone was cooking this way. The Kitchen Ecosystem tries to correct the great mistakes of post–World War II cooking: buying commercial ingredients, and working off recipes rather than ingredients. OC: So, what are some simple ways for a home cook to start building an ecosystem? EB: The first thing to do is a “pantry intervention.” Ask yourself: What do you buy frequently? Tomatoes, mayonnaise, chicken stock, fruit? For those ingredients, consider putting some up [preserving] or making homemade. It’s going to taste better and it reduces your carbon footprint. Recognize that there’s a skill arc. Don’t try to create an ecosystem all at once. Put energy into developing what you eat frequently. If you love mayonnaise, then you’re going to get it and it will take just a few minutes. That one intervention will improve the overall quality of food over the year. OC: How can busy folks tackle cooking fresh and preserving? EB: I do a combination of multitasking and nano-batches. Tonight, for example, tomatoes are fresh but at the end of their season, so they’re cheap right now. I bought a pound of tomatoes for tomato, onion, and gorgonzola salad, and another pound for canning. While I’m cooking dinner, I’ll put the tomatoes on for preserving. By doing two tasks, it’s not creating an extra to-do item or anxiety about “canning all day on Saturday” or worry about getting the seals right. Also, when I’ve got debris, such as shiitake mushroom stems, I’ll throw them in a saucepan with water, bay leaf, and lemon and boil the flavor into stock. Tomorrow I’m planning to do a beef stew, and the umami flavor of the mushroom stock will enhance that. And I’m minimizing my waste. OC: Tell us more about no waste. EB: I tell cooks to get rid of the compost can. Parsley stems, leek stems . . . anything you’re throwing in there can be used to make something flavorful. Do you look in your garbage can and it’s full of woody stems or orange peels? When I get my case of oranges to make fresh juice in January, I take a little zest off every orange. It freezes beautifully. And if you do it yourself, then you never forget you’ve made it. And that kind of sacrament—making an ingredient significant—is a great way to avoid waste.